Phase 1 of Panshanger Country Park opened to the public in 2014. It is a very interesting place to visit not only for geology enthusiasts but also for anyone who wants to visit a lovely outdoors environment free of charge. Two display boards have been designed explaining the geology of the Panshanger Country Park – have a look at them here (pdf) before you go along. 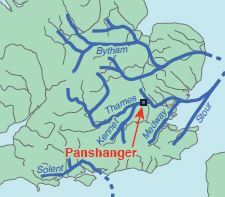 The first explains how the deposits came to be there and how the Proto-Thames formed the geomorphology of the local area. The second poster is about the history of the chalk deposits in the area, and was designed to be placed in front of the chalk pit near one of the lakes. Chalk was extracted from Panshanger and used with gravel for surfacing paths on the estate around 1880.